Your menu is a reflection of your restaurant. Is your establishment upscale and classy? Or friendly and neighborly? Fast or service-oriented? You can communicate all of that with your menu. But, coming up with a menu design on your own is tough—especially when you’re busy trying to run a successful business. 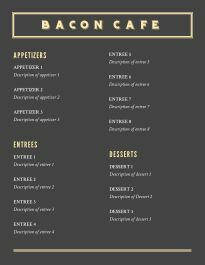 That’s why we’re providing you with an array of pre-made menu templates. Find one that matches your brand, then use our easy editor to customize the logo, items and prices. Select from a deep list of fonts and colors to make it your own. It’s that simple! 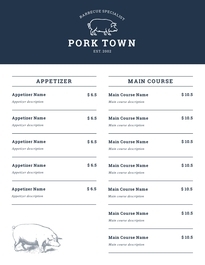 In a few minutes, you’ll have a professional menu that you’ll be proud to hand out to customers.